This entry was posted in Diet and Nutrition, Healing & Recovery Room and tagged turkey tail mushrooms on March 13, 2019 by Editor. Pink Himalayan salt has huge amounts of magnesium, sodium, potassium and other electrolytes essential for the body’s basic activities. It is also rich in iron, an important mineral for blood circulation and general vascular health integrity. Even calcium, which is a vital mineral for bones strength and well-built structure, is present in abundance. So let’s see how these salt crystals have turned out to be more precious and valuable than diamond crystals. In this link there are 15 mesmerizing health benefits of pink Himalayan salt that you probably don’t know. This entry was posted in Diet and Nutrition, Food & Water, Healing & Recovery Room and tagged SALT on May 10, 2018 by Editor. This entry was posted in Diet and Nutrition, Food & Water and tagged clones, fake meats, plastic on April 29, 2018 by Editor. What she doesn’t mention is that the LED technology expanding to street lights is being used as an INTERNET source instead of cable. Towards the end she mentions Senomyx…a nanotechnology fooling the senses, using fetal cells. This entry was posted in Diet and Nutrition, Geo-engineering, Chemtrails & Global Warming, Nanotechnology & Science Lab and tagged LED on March 7, 2018 by Editor. SENOMYX: List of FOOD companies using FETAL CELLS from aborted babies to flavor. Many propagandists claim that fetal cells are derrived from one cell line, one fetus, decades ago. Here is Sayerji from Green Meds research on the currency of fetal cell lines. “BIOTECH’S DARK PROMISE! SNOPES: Although Snopes dances around whether there are fetal cells in Pepsi…they confirm that Pepsi has a deal with Senomyx producers and that Senomyx indeed uses a technology that is derived from fetal cells. Aborted cells are used in the development of artificial flavor enhancers by biotech company Senomyx, with which PepsiCo signed a four-year, $30 million agreement in 2010 for research and development. No Pepsi products containing Senonymx flavor enhancers should be expected until 2013. The tongue of a foetus was used solel to develop a technology that could “taste” how sweet, sour, salty etc. To my understanding now, it is not in the products, but a potentially dangerous compound is. Nestles, Kraft, Pepsi, etc invested in the development of a profound compound whose patent papers show the size of the compound being like half of a copy paper. The consideration we are having is that were there any long term studies? How senomyx (unlabeled) works is that this compound in the product affects the taste buds. So instead of sugar, this compound is put in the product and fools your tongue to think their is sugar in the product but there is not…so no sugar calories. However, who is to say that this compound won’t destroy the taste buds with its repeated, unnnatural assault and leave our tastebuds damaged. We enjoy food and drink…we really enjoy taste so much that we overeat because though our stomach is full our mouths want some delight. What would the world seems like if we lost our tastebuds due to this ubiquitous unnatural assault? I have put in a FOIA request for a copy of their long term test that should have been done for FDA approval. To our knowledge, The only companies using Senomyx flavors are listed on this website: www.cogforlife.org/fetalproductsall.pdf . VLA Comment: Apparently, Cog for Life has done “extensive research” on the issue and is assured that there is no fetal DNA or cloned human DNA in the final products as the technology using fetal cells were just to identify the taste receptors in order to make “chemical compounds” to alter and fool our tastebuds. Although, apparently, except for using fetal cells of healthy but aborted babies to discover the mechanism of taste receptors, the final aim was to develope chemical compounds to alter our tastebuds. My question is how good is that for our species that we can no longer can trust our God given senses? And moreover, are these chemical compounds poisonous, carcinogenic or ultimately destructive to the organic tastebud receptors? Moral options exist for Rabies, Polio,Rheumatoid Arthritis. Separate moral optionscurrently not available for Measles and Mumps. VLA COMMENT: It must be over 10 years ago that VLA tried to influence the FDA regarding Senomyx when it was just getting off the ground. We did the same with GMO technology…but much of the corporate establishment knows no bounds when it comes to greed. There is more to know. This bears repeating: ASIDE FROM FETAL CELLS, These specialized molecules trick the tongue into not tasting the bitterness naturally inherent in foods such as cocoa or soy. Moreso, Senomyx is considered propriety and is not labelled. Think about the social implications of a child thinking he is tasting something sweet when it is not….it is just an affect the nano technology of synomex has on the tongue. Truly we are in an age that no one can trust their five senses. VLA Comment: Quote from Bittermyx (Senomyx) “Our scientists have identified the function of 22 bitter taste receptors responsible for sending the bitter taste signals in many API products used in OTC and prescription drugs. Leveraging this knowledge, Senomyx has developed a comprehensive bitter receptor profile to more effectively screen APIs and to identify the specific bitter receptors associated with bitter taste of a given API”. This entry was posted in Diet and Nutrition, Food & Water, Genetically Engineered Food, Government experimentation on the public, Pregnancy and birth, RESEARCH, STUDIES, DOCUMENTATION and tagged Fetal Cells, sayerji, Senomyx on March 7, 2018 by Editor. Smithfield Foods, purchased by Hong Kong-based WH Group in 2013, has been working to remove ractopamine from all company-owned animals, it said in a May 22 statement. Smithfield is the world’s largest hog producer and pork processor. VLA COMMENT: Ractopamine is banned in about 160 countries including CHINA. Unless the new owners Chinesof Smithfield ban the drug in their USA production, “natural thyroid” medicine will continue to be supplied by pigs given Ractopamine which affects the heart. A Canadian shipment of pig feet to China, produced by Olymel LP, has tested positive for residues of banned growth drug ractopamine and may curb future trade, Canadian government and industry officials say. China views the tainted shipment as a “systemic failure” of Canada’s program that certifies pork sent to China is free of ractopamine, and the situation “could affect future pork exports,” according to an email to the industry from the Canadian Food Inspection Agency (CFIA). VLA COMMENT: Looks like China is halting imports to China of hogs feed with Ractopamine. Wondering, however, is the China owned American company still uses ractopamine in domestic hogs that remain in the American market? What’s holding us back with exports? “We saw this China thing coming, but I thought we would get ractopamine out of the system faster than we did.” This feed additive that promotes lean muscle growth has been popular in the U.S. until recently, but is banned in China. Hayes estimates that half of the U.S. swine industry still feeds ractopamine, especially in the summer when the hog market is traditionally higher, but that number has shrunk in the past year as more packers go “racto-free” in their plants. This is a drastic change from just two years ago when the only U.S. pork company trying to eliminate ractopamine was Smithfield, and that was only on one farm in Illinois, says Hayes. The ability to export to China if your plant is racto-free means the feed additive is on the wane. Triumph Foods recently went made the switch to eliminate it from its farms and plants. This entry was posted in Diet and Nutrition, Food & Water and tagged hogs, Pigs, ractopamine on March 6, 2018 by Editor. This entry was posted in Diet and Nutrition, Fluoride Poison, Food & Water and tagged water on February 25, 2018 by Editor. You’re not going to like this one bit: you’ve been lied about the health benefits of coffee! 1. Caffeine is an alkaloid that the coffee plant uses to kill bugs, which eat its’ seeds. The coffee plant also uses caffeine in the coffee pods to kill surrounding plants, so the coffee plant can attain more sunlight and grow larger. 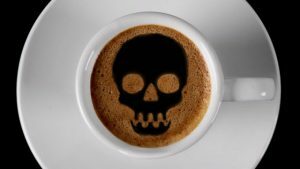 Caffeine is a pesticide, which causes genetic termination in living cells that come into contact with it. This entry was posted in Diet and Nutrition, Food & Water, RESEARCH, STUDIES, DOCUMENTATION and tagged coffee on February 19, 2018 by Editor.